I missed my birthday and blogiversary last fall but have since reached some personal milestones thanks to all of you so I wanted to give back. 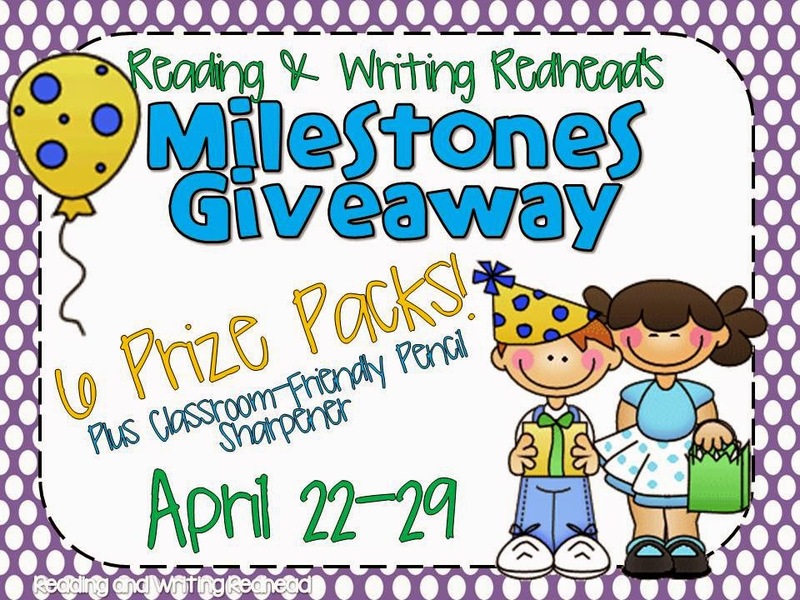 51 teacher-authors and I have joined forces to bring you Reading and Writing Redhead's Milestones Giveaway! There are 6 prize packs, plus Classroom-Friendly Pencil Sharpeners kindly agreed to giveaway one pencil sharpener! I did my best to sort the prizes by grade level, but even if you don't teach a certain grade you may want to look at the products included in that prize pack. For example, an item that is suitable for grades 2,3 and 4 may be in the grades 4 and up pack, but a second and third grade teacher could totally use it! Now in totally random order! The Grades 2 and 3 Language Arts Pack includes 11 items! They are listed in the rafflecopter below the image. The Grades 2-3 Math Prize Pack has 7 great products. They are listed in the rafflecopter below the image. The Clip Art Pack has 4 terrific products from 4 terrific designers. They are detailed in the rafflecopter below the image. Ah, the Classroom Friendly Pencil Sharpener! To enter the Classroom Friendly Pencil Sharpener Giveaway, use this rafflecopter! 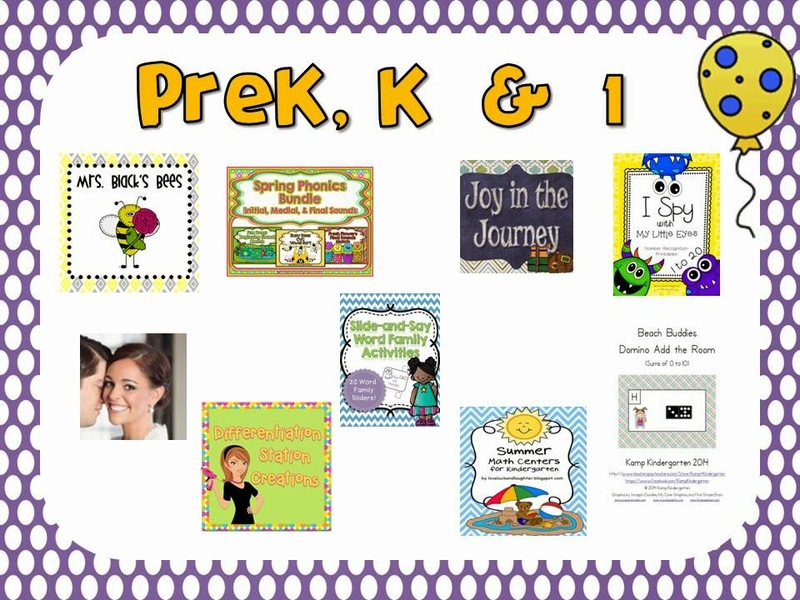 The Prize Pack labeled as PreK, K and 1 has 9 wonderful products! They are listed in detail in the rafflecopter below the image. 11 super teacher-authors offered winner's choices for this prize pack. You would get to choose anything you like from their stores. Look at the image below or the rafflecopter to see who donated for this prize pack! And the grades 4 and up pack has 8 terrific items that can even be used by a variety of grade levels. They are listed in the rafflecopter below the image. Thank you so much to all who donated and good luck to all who enter! Great and amazing giveaway! Between now and the end of school - June 25 - I'll be doing A LOT of math; also social studies and science. We will be working on shapes and persuasive writing. We just did a lot of geometry in my room! So fun! Thanks for stopping by, Lori! I am really excited about the pencil sharpener and all of the other packages too! I will be teaching a chemical unit, economics, probability, theme, measurement, and throwing some writing in as well. What a great giveaway~ I will be keeping my fingers crossed! Wow! What a wide variety of topics! Hope the end of the year goes well! I am excited about all of the prize packs!! Each one of them has products from fantastic creators!! I would be grateful to win any of them! Great giveaway! I will be teaching/reviewing long vowel sounds, comprehension for K.
All the packs are great...but I would be most excited about winning the K, 1 group! Super! Hope you have a wonderful end of the year Kelly! Thanks for commenting! Congratulations! I would love to win the sharpener! I really need some more alphabet and sight word packs for the final push this year! Clip art would help or prek and k packs, definitely excited about those!! Cool! I am glad some of the packs have things you could use! Working on writing chapter stories. Excited to win any of the packs! Thanks for entering, Suzy Q ! I just entered to win! Too exciting! Great ! I will be announcing winners tomorrow. Thanks for entering! Hoping to win....what a great giveaway! Our giant bird study is in full swing! Wow ! That sounds very interesting!